For those of you that know Diezel, the VH4 needs no introduction. For those that don't, the VH4 tube amplifier is one of the most popular, highly regarded, high gain amps ever created. Diezel now brings its legendary tone into an affordable preamp pedal. When musical architect Peter Diezel created the Diezel VH4 in 1994 he unknowingly sparked a revolution in tone, creating such a demand that he literally had no choice but to put his own personal creation into production. More than 20 years later, the VH4 has become one of the most loved high gain mps in the world and the powerhouse that put Diezel at the forefront of music with some of the most iconic players (from Metallica to Guns N Roses) performing with it on some of the biggest stages and in studios around the world. 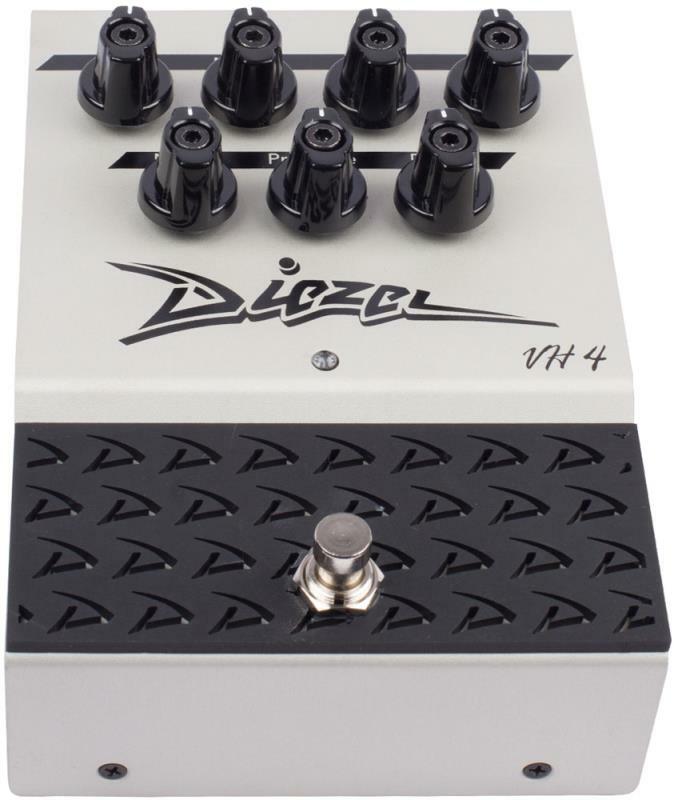 For the first time ever, this powerful performance tool can be found in the new Diezel VH4 Preamp Pedal with all the lush, dynamic overdrive character of the VH4 Channel 3. 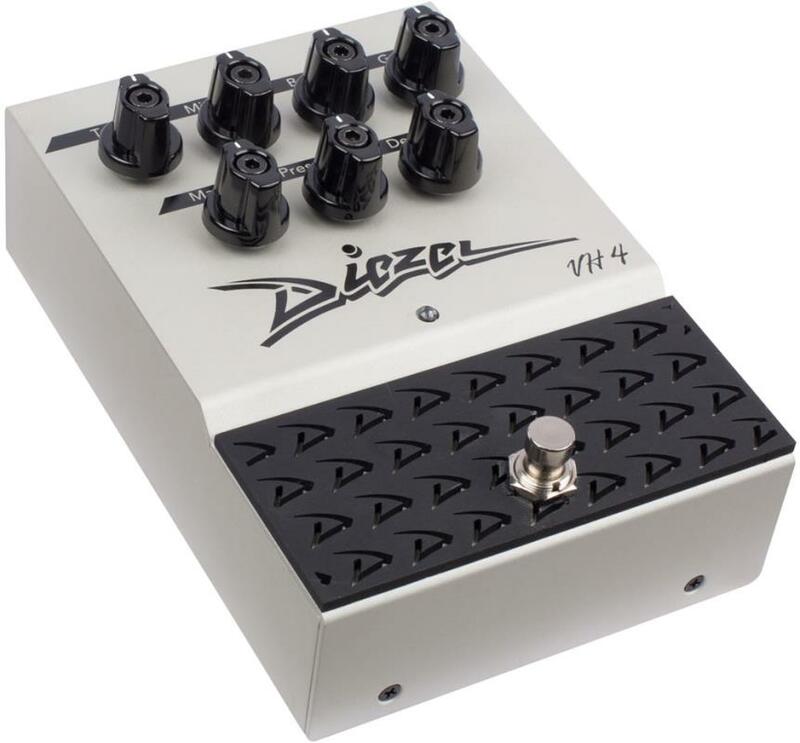 Unlike traditional overdrive stomp boxes, the VH4 Pedal is a true preamp which delivers an authentic representation of its namesake - real Diezel tone - not emulated, not modeled, but sincerely reproduced. 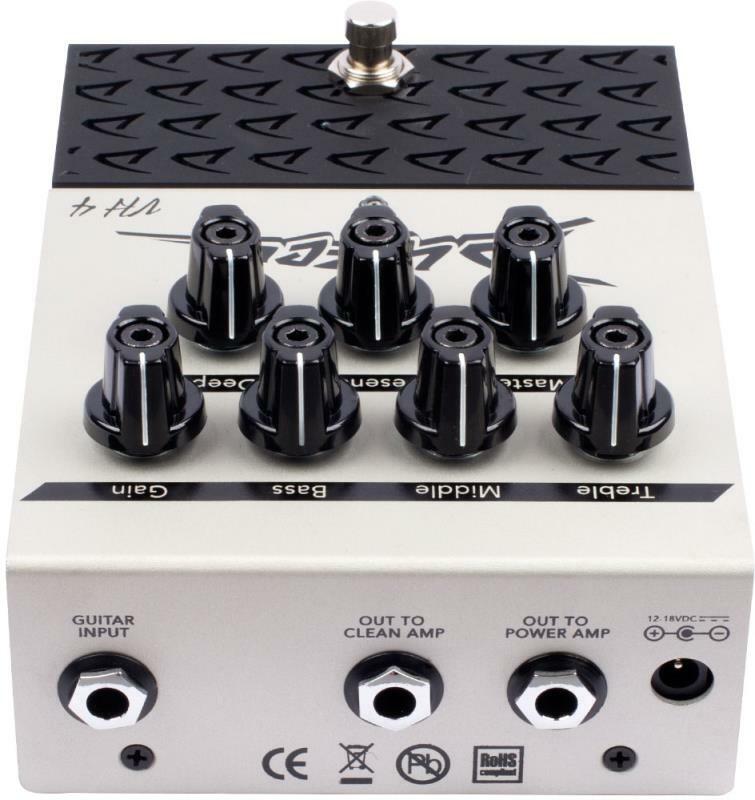 The entire signal architecture is faithful to the original: Bass, Mid, Treble and variable Deep and Presence controls allow you to tailor the uniquely Diezel Overdrive character. 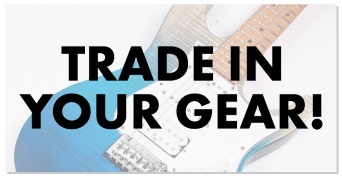 The command found in the Gain control gives a player everything they will ever need with lower gain settings producing the classic Diezel sparkle and chime to saturated mid-gain sounds, to scorching Diezel leads by cranking it all the way up. 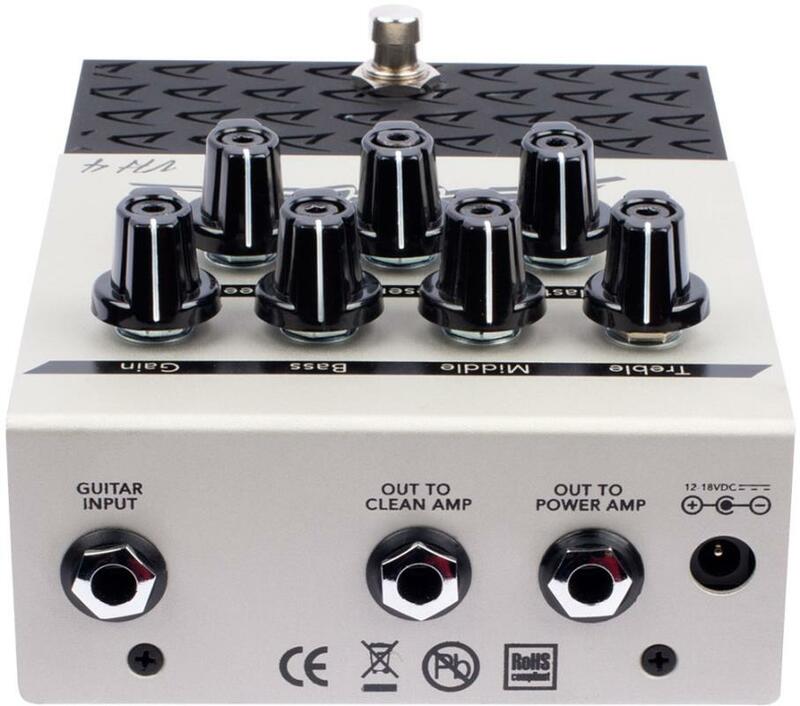 As close to the original VH4 preamp, the VH4 pedal can be used as either an overdrive or as a standalone preamp to feed into your amps power section. What players take away by going direct into the power amp is all the dynamic, unfiltered Diezel tone by simply plugging into your amplifiers clean channel. 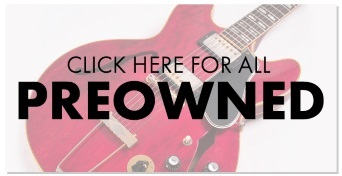 Two outputs are provided with the first intended to connect to the front of a guitar amplifier and the second allows for a connection to a line-level power amp or power section of your amp via the Effects Return. Founded in 1994 by Peter Diezel and Peter Stapfer, Diezel Amplification continues the commitment and fundamentals of combining traditional architecture with modern features to achieve the widest possible range of amplified sounds on stage, in studios or at home. Building the highest quality all tube amplifiers, with the highest possible hand-craftsmanship, Diezel understands player's needs – the passion for sound, quality and versatility. 'Made in Germany' for professional use, Diezel supports environmental friendly, non-mass-producing manufacturing with a focus on the future development of state-of-the-art amplifiers for today and tomorrow.